This is one of my favorite places to paddle! 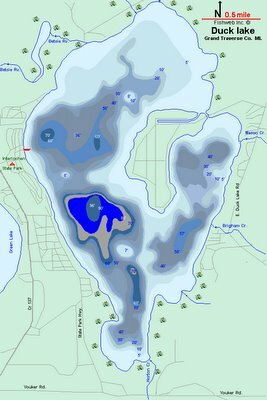 Duck lake, in the Interlochen/Grawn area, is an exciting lake to explore. If you are using an ocean boat this is a fun lake just to paddle around on. It is flat most of the time. I rarely see waves over 12" due to it being so far inland. I have heard that a few greenland kayakers use this lake to practice rolls. As you can see from the depth map, it is shallow over much of the lake but has some deep spots good for swimming. However, it is important to remember that this lake has swimmers itch so I usually swim out near the center. When I paddle this lake I usually take my Perception Acadia 12.5. The reason why is there are some shallow, hidden ways to paddle off this lake and end up in another lake. They may require you to get out of your boat once or twice but that usually depends on water level. The first way off the lake is Lilly Pad Lane. This one is fun, takes about 15-20 minutes, and usually you can stay in your boat. If you look at the north side of the lake, which is the very top of this pic, you will see an unmarked little stream. This leads to Lake Tonawanda, which is a small lake with no public access (that I know of). I do not know if you are crossing private property so be respectful and don't litter. There is no place to get out of your boat anyway. I like this paddle because it goes right though the woods and is very peaceful. There are beaver dams in the spring but someone, probably fisherman crossing from lake to lake, clear them out. Try this one and let me know how it went. The second paddle is more of an adventure. The very beginning of the Betsie River is on Duck Lake and is just a little west of Lilly Pad Lane. There is a dam at the beginning and you just need to portage around that. 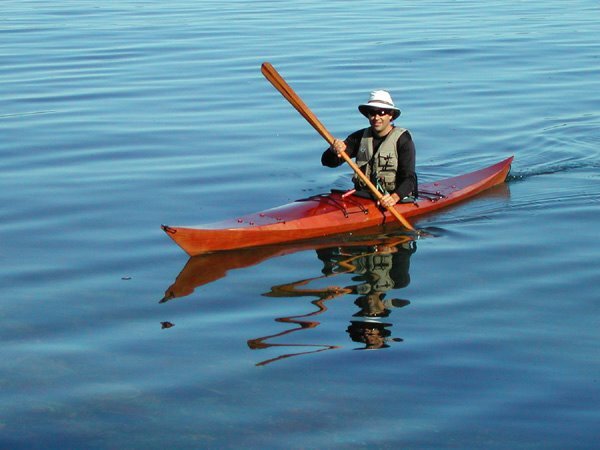 You will paddle though some slow flowing water until you come to a small private lake. I have no idea what it is called yet because I keep getting different answers. It is a cool lake though. I has an old duck hunting blind rotting out in the water. I also heard the fishing is good. If you paddle to the south side of the little lake you will come to a stream that will take you all the way to Green Lake. It has been a couple years since I did this one. I remember having to pull my boat over a couple logs. I highly recommend having a plastic boat for this trip. You will go though a couple drain tubes. I believe this trip took about 3.5 hours. I brought a foldable cart to walk my boat back to Duck lake from Green. I had started on the Duck Lake Peninsula. If you planned it right, you could leave one vehicle at the end. If anyone does this, let me know how it went. I plan on doing them both again this summer. Contact me if you want someone to paddle with! Good luck! I have been a once in a while kayaker for years. I built a CLC boat for my main boat and also have two 12.5 foot Perception Acadias for river paddling. 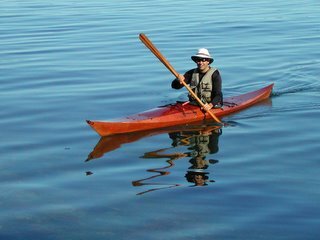 Recently I have become somewhat obsessed with Greenland paddling and techniques. I have been devouring any info I can find on boats to build and paddles to make. My only worry was that, after spending 60-80 hours building a boat, I might not like it and need to build another. So I went to this party across the street from my house. My neighbor, Mona (lovely women), was a kayaker but doesn't do it anymore. She had this beautiful Valley Anas Acuta sitting in her garage. She sold it to me for......$200!!! She was just being a friend and made me promise it would get some use. What kind of luck is that? It was like a direct answer to my prayers. The boat is from 1990 but in beautiful condition. I just had to order new hatches because the old ones had rotted. I can't wait to get this in the water. Chesapeake Light Craft has finally jumped on the low volume bandwagon! I am impressed with the Shearwater so far! What a beautiful Greenlandish style and clean lines. I haven't paddled it yet but I am sure I will have a chance in the near future. 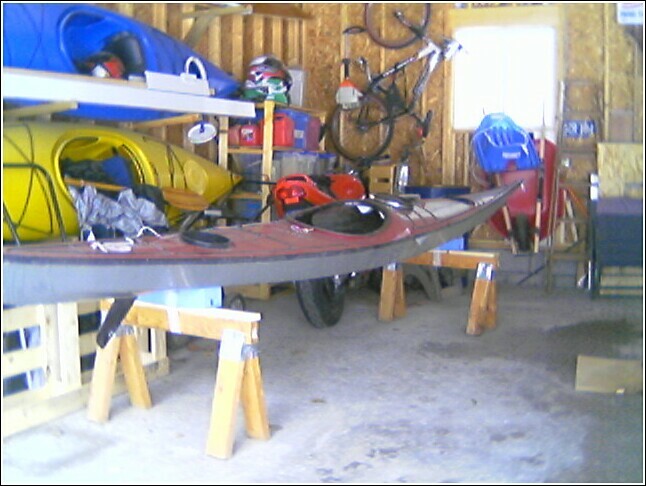 I built a CLC Patuxent 19.5 in 2000. It was a fairly easy build. After completing one off of plans, I would go with the kit next time. The kit for the Shearwater runs about $999. Very cool boat! Way to go, CLC!